If, like me, you don’t have someone “special” to exchange heart-shaped confectionery with today, how about this: As you go about your business find six strangers to connect with. It could be as simple as “hello” or “I like your hat”. It will make you feel good, probably make six strangers’ days less lonely, and who knows, maybe one of those strangers will be me, and maybe I’ll like your hat too, and maybe we’ll go for coffee and fall in love and maybe next year we’ll exchange hat-shaped confectionery. I mean, why not? Sophie...I think you would just need to hand over one of your Missed Connections drawings and that person would fall in love with you! a perfect valentine's wish. i'm going to keep my eye out for the guy with the hat! brilliant. gorgeous picture and a sentiment so sweet it makes the whole day seem better. From one single to another ... I think that's the most darling idea/adventure I have ever heard and I hope that we both find who (and what) we are looking for just in time for the next Valentine's Day! That's adorable. I would love to share hat shaped confectionery with someone one day. Just out of curiosity: Does anyone know where you can turn in a Missed Connection? Perhaps a link, maybe? I'm actually doing that, talking to strangers and trying to lighten up days, mine and of others, quite often at my work at the airport. It's about showing I care. A smile is a beautiful reward. A warm thank you from Italy! such a good idea, lol I love the idea of hat shaped confectionary though! and of course beautiful drawing as always! Gorgeous! Have you read a poem called 'The Silver Hat' by Philip Ridley? It goes very nicely with this image. too cute. love the idea. Being open to people will open the way to love - where searching for love can sometimes close you off from people! Wonder and joy win in the end. This is the first time I've left a comment on your blog and I couldn't leave without saying how wonderful, inspiring and ever so beautiful your work is! LOVE! I'm not a big fan of V-Day, but this is wonderful. 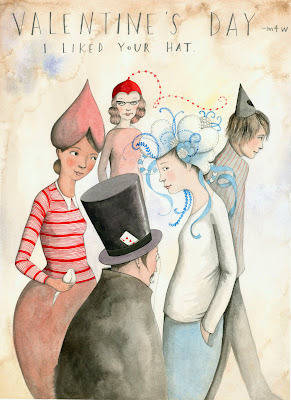 Not only the idea, but the drawing and the thought of exchanging hat shaped confectionery! I too wish I had seen this on Valentine's Day. I love this so much! Thank you for sharing your talent. I really like the original ad's idea about making someone's day too! Yes, a fantastic idea to speak to strangers - a great idea for Valentine's Day, or any day! Thank-you for sharing your beautiful work. Always makes my day. Seriously, this is a New Yorker cover. You need to have your people call their people. Keep up the good work! I did this yesterday. I saw this post after Valentine's day and then I suddenly remembered about it. I went to the bakery and saw the baker make some sweet goodnesses. So I said to her "It must be really awesome to work at a place where so many sweet things are created, it looks great." And she said "No, it's not awesome", but kept on smiling for a few minutes. I guess she wondered at my childish naive behaviour. It made me feel sweet.